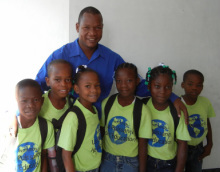 Joseph Geordanie Fleurant (Jordan), Principal and Director of Operations in Haiti, has been a community leader and educator his entire adult life. He grew up in the Grand Ravine neighborhood of Port au Prince, known for its extreme poverty and gang violence. Whereas the slum of Citeformal work experience includes interpretation services for Project Medishare (a large medical missionary group that responded after the earthquake), a teacher of English classes, facilitator children’s groups to keep them “off the streets” and principal at a school prior to the Power of Education Foundation. His dreams include furthering his education to help him improve his skills as a school administrator, to have a house of his own (he currently lives at the school) and for his daughter to have a better life outside of Haiti. Evenson Jacques, Director of Educational Achievement, is 38 years old and lives in the Martissant neighborhood with his 2 nephews and brother. He was born in the country side village of Miraguane-Paillant where his mother still lives. His Father moved to France to find work and is a taxi driver there and is still in relationship with and supports his family. Evenson has a university degree from INECLAV in communications and psychology and has participated in several formational training programs. His dreams include increasing his role as a leader that can change his community for the benefit of its children. In his leisure time he plays guitar, enjoys reading and provides grief counseling to those in need. Emso is our 5th grade teacher. He has completed 13 years of education including the terminal year of secondary education. He has also completed a professional course in pedagogy and is currently studying accounting and management. Every day at 3:30 after school, Emso teaches an adult literacy course at another school in Fontamara. Approximately 50 adults participate in this course that includes some of the parents of PEF students. He was particularly proud that in a short time he was able to teach all of them to write their name and telephone numbers whereas they could not do this when they first arrived. He dreams of going to university somewhere outside of Haiti where he can earn an MBA. He states that he is too busy with work and studies for much leisure time but likes to research various topics on the internet. Claudy Marcelin is our fourth grade teacher. He is 43 years old and is married with three children ages 10, 8 and 5. He has completed 13 years of education including the terminal year of secondary education. He has also completed a professional course in pedagogy, is trained as an electrician and is currently learning English. He was born in Anse-A-Veau and now lives in Fontamara. Ever since he was a little boy he dreamed that he would someday be able to help other kids. He has several years teaching experience and used to be the director of a school. His current dreams are to continue teaching and advance his career so that someday he could be head of the MENFP. In his leisure time he likes to read, help his kids with their homework, play the guitar and describes his wife as his best friend. Daniel Mildrenne is our third grade teacher. She has completed 13 years of education including the terminal year of secondary education. She has also completed additional teacher training and attended a seminar conducted by UNICEF about the rights of the child. She is currently studying accounting at a university. She had ascholarship to study at Kent State University, but because of financial difficulties she was unable to attend. She would like to have her own business enterprise and is therefore studying accounting. She loves to teach but says that you never know what life could bring you and she believes that she should always be learning so that she can be prepared. In her leisure time she likes to watch movies and research various topics on the internet. Lina Easimur is our second grade teacher. She is 36 years old, married with two children and there are 5 people living in her household. She has completed 13 years of school including the terminal year of secondary education. She has also completed 3 years of professional teacher training in a school in Martissant. She was born in Ti Goave and now lives in Fontamara. She has an interest in medicine originally wanting to be an obstetrician; however, she could not afford to go to the university. She decided to go into teaching because of her love of children. In her leisure time she enjoys reading, watching television and playing with her kids. Ursule Juin Jean is our first grade teacher. She is 37 years old, married and has two young children. She was born in Anse-A-Veau and now lives in Fontamara. She has completed 13 years of education that includes the terminal year of secondary education. In 2003, she completed a professional formation program for teachers and placed value on the training that she has received through PEF. In addition to teaching she is a baker and decorator often working for churches, weddings and parties. She became a teacher because she loves kids, finding this out by helping her sister’s kids when they were in school. Her dreams include teaching in a vocational school in addition to what she describes as the classical school of PEF. She enjoys reading and decorating in her leisure time. Nicole Denis is our Kindergarten teacher. She is 25 years old and describes herself as “not yet married with kids”. She does have two Godsons that live in the same household that contains 9 family members. She has completed 13 years of education that includes the terminal year of secondary education. She was born in Port au Prince and now lives in Carrefour. She started a teacher training program but this was interrupted due to the earthquake. She would like to complete this or similar training. She wanted to become a teacher because she loves kids and actually used to assemble kids in her neighborhood who could not go to school and teach them for free prior to PEF. She has also completed her studies in nursing. Her dreams are to travel to the United States or another developed world so that she could complete a Master’s degree in either teaching or nursing. In her leisure time she enjoys reading and preparing her lesson plans for the kids.